Despite heavy rain and a power blackout, CES 2018 managed to excite the technology-loving community with an array of shiny new gadgets and gizmos. 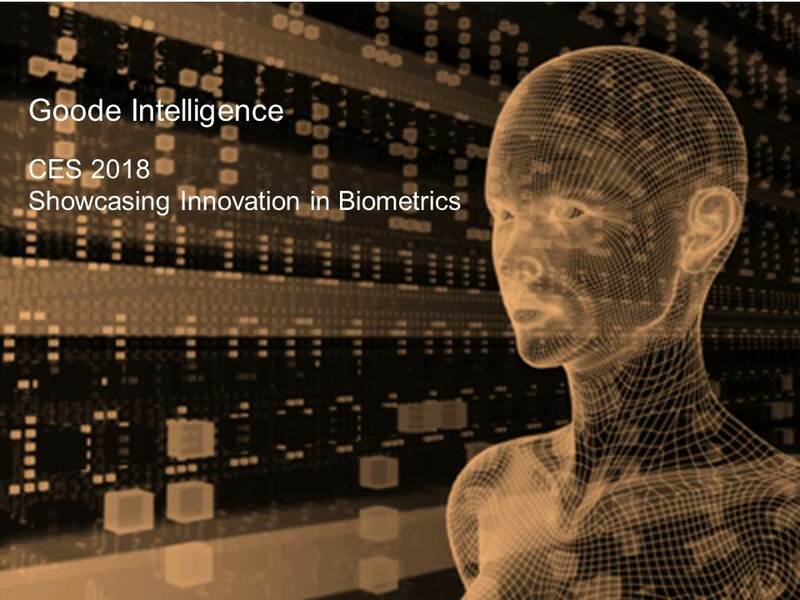 Biometrics was again one of the key technologies at the show and a number of key areas that Goode Intelligence covered in 2017 were showcased in Vegas including biometrics for the connected car, the arrival of in-display fingerprint sensors and decentralised authentication. Connected Car and other things…..
For an ultra-connected future, a smartphone may not be your primary device for getting access to the net. The Internet of Things (IoT) offers a world where devices get smarter and are connected to the internet. As more smart things get connected we need a convenient and secure method to identify ourselves with. My personal robot butler and the autonomous vehicle that has just turned up at my house to collect me both need a way in which they can accurately identify me. As our recent analyst report on biometrics for the connected car testifies there are a number of ways in which biometrics can be supported for connected cars and other things; leveraging the biometrically enabled smartphone or smart wearable devices or through integrated biometric sensors located either outside or inside the car. At CES 2018, the connected ‘smart’ car with autonomous features was one of the major themes of the show. Gentex, a major automobile supplier, made a number of announcements including its Iris in-vehicle biometric solution in partnership with Fingerprint Cards (supplying their ActiveIRIS solution). The two companies used the show to announce a long-term partnership agreement that will see Gentex use Fingerprint’s ActiveIRIS solution in Gentex’s automobile solutions. BYTON, a start-up automobile company, announced a smart SUV that uses facial recognition to unlock the doors and to support personalisation for drivers and individual recognised passengers. The company is aiming to go into production during 2019. Face is also being used for a partnership between facial recognition specialist, FaceTec Inc and IAV Automotive Engineering for their ‘James’ connected car project. FaceTec’s ZoOm 3D facial recognition system will be used to manage vehicle access control. The combination of facial and voice recognition is being suggested by Volkswagen for its retro I.D. Buzz concept vehicle. In partnership with Nvidia, the German auto giant has designed two new features called Drive IX and Drive AR. Drive IX supports an ‘Intelligent Co-Pilot’ feature that uses facial recognition for access control – recognising the authorised driver/passenger as they approach the vehicle. Drive IX also supports advanced driver assistance functions in monitoring a driver’s face for distraction and tiredness signs. Smart Mobile Device OEMs have been wrestling with how to support biometric authentication for full-display no button displays. Apple decided to ditch the fingerprint sensor completely and go with 3D facial recognition. Android device OEMs can either emulate Apple and integrate 3D facial recognition systems or integrate fingerprint sensors in or under glass. Engineering problems with traditional capacitive fingerprint sensors and thickness of screen glass have delayed the anticipated arrival of in-display sensors. Vivo demoed a yet unnamed smartphone at CES 2018 that uses a Synaptics Clear ID FS9500 family of optical fingerprint sensors that can be integrated in an OLED display. The Synaptics Clear ID sensor is a CMOS image sensor that is 1.5mm thick. Synaptics believes that the market for in-display sensors to be 70 million units for 2018 and it certainly gives mobile OEMs a choice of biometric authentication options for the latest range of full-display OLED smartphones. Goode Intelligence forecasts that nearly 900 million fingerprint sensors will be shipped in Android smart mobile devices during 2018  so the in-display market will represent approximately eight percent of the total market. HYPR demoed its decentralized authentication platform at CES 2018 using Apple’s Face ID facial recognition system on an iPhone X in addition to voice recognition to support a number of scenarios including a bank customer accessing online and mobile banking and an employee using Iris and fingerprint biometrics on a Samsung Note 8 device to authenticate into an enterprise environment. HYPR’s third demo was based on a next generation ATM from Diebold-Nixdorf to support cardless access to a bank’s ATM. CES is a great weather vane for emerging technology providing us with a glimpse of what we might expect for the biometric industry going forward. The activity at CES 2018 chimes with our predictions for the year ahead  with increasing activity in IoT and automobile industries as well as accelerated adoption for financial services.